Photo Editing and Enhancements has long established itself as an essential service and a compulsory requirement to Professional Photographers for Photo Post Production Editing and Enhancing the images and photographs used in the commercial space. Be it e-commerce companies vending their wares, or the real estate companies flaunting the properties they have up for sale, or large products and companies using images to build their brand. All of them depend to a large degree on photographs and images to tell the word their story and ply their trade. With the growing need for photograph and images the need for it to be edited and enhanced has only become larger. As in any process when a particular function grows in importance and criticality at the right volumes it begs to be outsourced and specialized upon. As has been the case with photo editing and enhancement the reasoning and drivers have been many. In broad it has been about the skill and training to use the editing tools and software coupled with cost of the software and the need to stay abreast with the latest versions. Once the need to outsource gets established and stakeholders accept and use the model, the service providers in today’s time and age can be in far flung places and geographies. It truly becomes a competitive global market; same has been the case with image editing and enhancement. Like in many other fields and areas, India has established itself as a front runner in the photo editing and photo enhancement space. The reasons are reasonably straightforward. The abundance of trained personnel, the growth in telecoms and connectivity providing the base infrastructure, the price advantage and sustained quality delivered consistently, knowledge and proficiency in the English language has sure played a significant part as well. 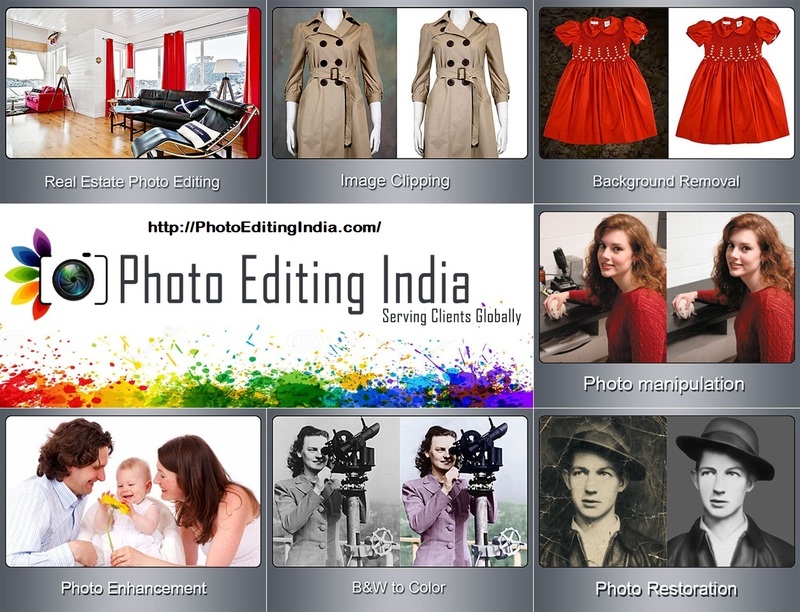 Digital Photo Enhancement is made of many services and India is a frontrunner in many. Portrait Editing Services in India is extremely popular with portrait photographers, also Photo Post Production Editing for Wedding Photos with wedding planners and wedding photographers world over. Photographers and companies from across the globe, more so the western world are outsourcing and farming out their post shoot editing process to companies and experts from India. In some of these countries the times difference works to be an advantage improving overall turnaround times. Improving infrastructure and high speed broadband connections and leased lines contribute to the ease with each large image files are moved across the internet, through dedicated FTP transfers. Image file by nature are heavy, more so the RAW format image files favored by most photographer and image enhancement professional alike. The fast file transfers make the overall process of the photographer sending the RAW image files to the experts in India and the image editors sending back the finished finalized perfect pictures back to the photographer. The ease of this whole process is almost the same as one moving files from folder to another which almost anyone is comfortable doing, except the folder are situated thousands of miles apart. Language and the ease with which the photographer and the editors are able to communicate add to the overall benefits. Most importantly the high quality images that is delivered every time , time after time is the clincher to the growth in the photo editing companies in India catering to photographers and image companies across the globe. Photo editing and enhancement has long established itself as an essential service and requirement in professional photography and in the use of images and photographs in the commercial space. Be it e-commerce companies vending their wares, or the real estate companies flaunting the properties they have up for sale, or large products and companies using images to build their brand. All of them depend to a large degree on photographs and images to tell the word their story and ply their trade. With the growing need for photograph and images the need for it to be edited and enhanced has only become larger. As in any process when a particular function grows in importance and criticality at the right volumes it begs to be outsourced and specialized upon. As has been the case with photo editing and enhancement the reasoning and drivers have been many. In broad it has been about the skill and training to use the editing tools and software coupled with cost of the software and the need to stay abreast with the latest versions. Once the need to outsource gets established and stakeholders accept and use the model, the service providers in today’s time and age can be in far flung places and geographies. It truly becomes a competitive global market; same has been the case with image editing and enhancement. Like in many other fields and areas, India has established itself as a front runner in the photo editing and photo enhancement space. The reasons are reasonably straightforward. The abundance of trained personnel, the growth in telecoms and connectivity providing the base infrastructure, the price advantage and sustained quality delivered consistently, knowledge and proficiency in the English language has sure played a significant part as well. Digital Photo Enhancement is made of many services and India is a frontrunner in many. Portrait Editing Services in India is extremely popular with portrait photographers, also Wedding Image Editing in India with wedding planners and wedding photographers world over. Photographers and companies from across the globe, more so the western world are outsourcing and farming out their post shoot editing process to companies and experts from India. In some of these countries the times difference works to be an advantage improving overall turnaround times. Improving infrastructure and high speed broadband connections and leased lines contribute to the ease with each large image files are moved across the internet, through dedicated FTP transfers. Image file by nature are heavy, more so the RAW format image files favored by most photographer and image enhancement professional alike. The fast file transfers make the overall process of the photographer sending the RAW image files to the experts in India and the image editors sending back the finished finalized perfect pictures back to the photographer. The ease of this whole process is almost the same as one moving files from folder to another which almost anyone is comfortable doing, except the folder are situated thousands of miles apart. Language and the ease with which the photographer and the editors are able to communicate add to the overall benefits. Most importantly the high quality images that is delivered every time , time after time is the clincher to the growth in the photo editing companies in India catering to photographers and image companies across the globe. Photo Editing Services for individual and business organizations || Professional Photo Editing Services || Benefits of using Photo Editing Services ||Outsourcing your Photo Editing Works to India ||India an emerging hub for Product Photo Editing Services.